Today Edgar brought his tablet back to school, and at the end of the day I was able to record him sharing an amazing 15 minute tour of not only these worlds but several more. These include an absolutely incredible re-creation of the Hogwarts castle and grounds, another medieval castle, a mansion, a large commercial aircraft, and more. Please take a few minutes to not only see Edgar’s Minecraft creations but also describe how he built these. They are amazing! How inspiring it is to see what students can build when they are empowered with creative tools AND have the desire to CREATE! I think you’ll agree Edgar is extremely gifted in his visualization and design skills. He created most of these 3D models by looking at 2D photographs in Google. If you’d like to leave a comment for Edgar directly, you can comment on this cross-post on his class KidBlog. 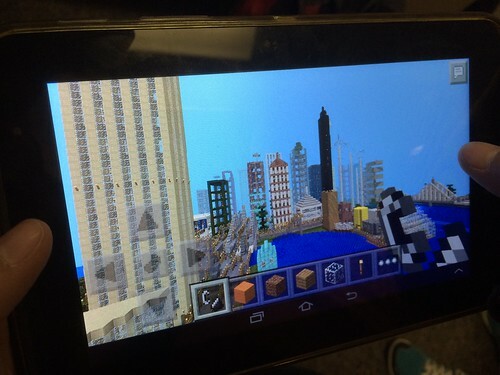 About three weeks ago, another of my 4th graders (Shon) brought his Android tablet and showed me several of his creations using Minecraft Pocket Edition. They include a model of the Space Shuttle and a very impressive Spanish galleon sailing ship. 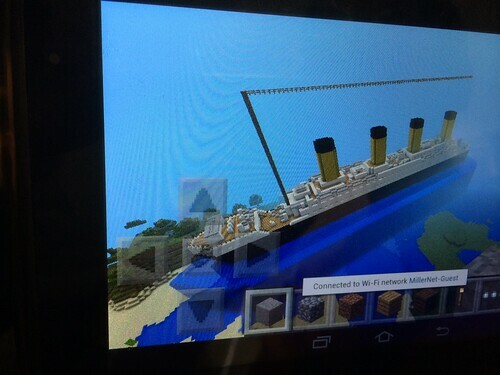 I recorded a 3.5 minute video of Shon showing off these Minecraft creations.